The “Second Week”: Week Twenty-One/Session Two. Theme: The Kingdom of God. Our reading for today: Matthew 6: 7-13. What follows next in Matthew’s gospel is known as the Lord’s Prayer. John Wimber, my mentor, would often say that this title actually mis-represents the passage. In truth, the prayer that is found here in Matthew’s gospel (and the shorter version found in Luke 11) is one offered by Jesus in response to His followers’ request to teach them to pray. So, in Wimber’s viewpoint, this prayer just might be better described as the Disciple’s Prayer! But regardless of its’ title, this prayer has become, over the centuries, the most recited prayer in the history of the world. The ‘Our Father,’ as it has become to be known in many circles, is so familiar to most Christians, we’ve sadly allowed it to become dry, empty words we simply recite from memory whenever we get to ‘that part’ of the worship service. But to Jesus, these words were so much more than a ritual. So much more than religious syllables repeated in a pre-determined cadence. And as I see it, it’s vital for anyone who truly wants to know the heart of Jesus to take the extra time to unpack this amazing prayer, removing it from our religious rituals and once again allowing the words to go deep into our heart and soul. You see, for Jesus, we never see Him struggling with decisions that fall into the two categories St. Ignatius defines as Evil or Good. It’s obvious that the Master had made that major decision of the Two Standards (see our readings from week seventeen) long before His three-year mission on earth ever began. But we do find Jesus wrestling at times with His choices (Election) over “two or more good options,” with the most obvious example being His time of prayer in the Garden prior to His trial and crucifixion. Here, Jesus, from all appearances, seems to be wrestling with His personal will vs. the will of His Father. And in His humanness, He asks His Father if there is any other way to complete His mission without having to face this excruciating death He was about to experience. Give us today our daily bread. And forgive us our debts, as we also have forgiven our debtors. Your Kingdom, Father; Your right to rule and reign, is forever and ever. Establish Your reign here in my generation, in my time, in my life today. Make this present moment coincide with all that is good. May Your Holy Heaven invade this present darkness, turning death into life; unbelief into faith; despair into hope; and hatred into love. Your will, Poppa, not mine. You see, when it comes to choosing between two or more good options, for Jesus, the Election always ended with choosing Poppa’s will, over and above His own. And while some might question if Jesus, the Son of God, ever really had a choice to do something outside of the perfect will of the Father, I’d suggest here that Jesus of Nazareth, the God-man that He was and still is, is modeling for us the same process He hopes you and I will use when faced with making major decisions in our lives. So whose will are you seeking today? My prayer: Abba Father, You are, indeed, the Supreme Being at the Center of the Universe. I yield my life and my interests to Your Kingdom will. I choose this day to defer to Your desires, Your right to rule and reign, while laying my own personal desires down at Your feet. Because Yours is the Kingdom. Yours is the power. To Your Christ, alone, be the glory and honor. Forever and ever. For Your name’s sake. Yes and Amen. My questions to ponder: Kingdom-driven choices are often hard decisions between my self-centered desires and God’s best interests for my future. Where in my life today is there a struggle over these good things? 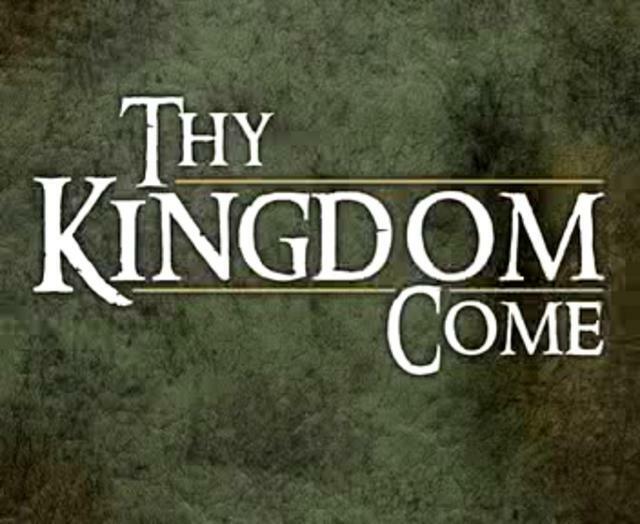 What might it look like for me to believe that ‘God’s Kingdom come’ can actually benefit me more than if I had my own way? This entry was posted in Our Ignatian Prayer Adventure by The Contemplative Activist. Bookmark the permalink.